I wonder if I can fully explain the depth of opportunity you made possible with your open-hearted, abundant, empowering grant. 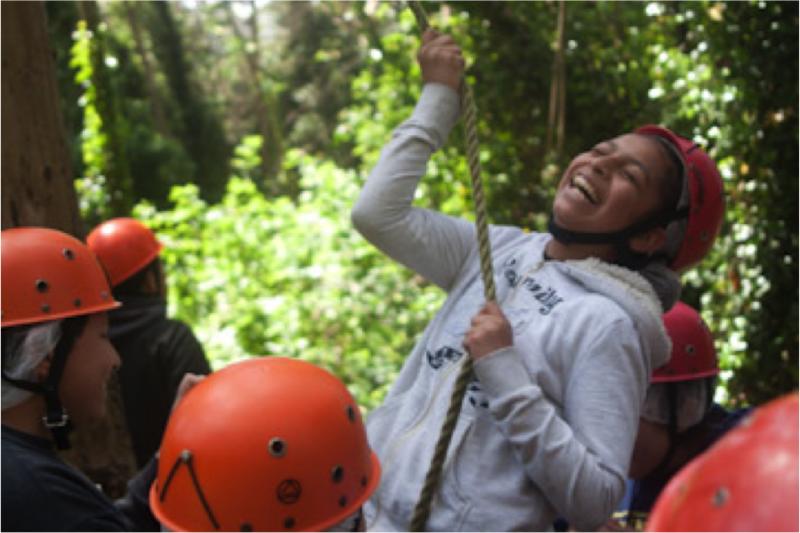 For me personally, this grant made my heart soar; as a second-year classroom teacher—struggling to bring my outdoor education background meaningfully into my urban, gritty classroom—our day at the White Hawks Ropes Course felt natural and satisfying. More importantly, to show my students another type of learning in a wide-open and totally new setting unlocked all kinds of observation, teamwork, and joy. We had an amazing time working with Ed Lopez and his Wilderness CEEP students at the ropes course, and I cannot thank you enough. My students are hilarious, gritty, thoughtful, moody 7th graders. In many ways, they are perfectly normal teenagers. Yet they carry the additional challenges of growing up in very low-income neighborhoods, rarely experiencing the world beyond their familiar streets. Ninety percent of our students receive free or reduced lunch. The majority are Latino who speak English as their second language. In this population of students traditionally underrepresented among college graduates, our school boasts a tremendous 100% college acceptance rate for the 12th graders. Many of our students will be the first in their family to attend college. We know that to prepare our students to get to and through college, we must support an enormous amount of character education and non-cognitive skill-building, starting in our students’ first years with us. You allowed us to do just that. Spending the day at the White Hawk Ropes Course Wilderness School at San Bruno Mountain State Park was a perspective-altering opportunity. Staffed by the charismatic and authentic student role models of the Jefferson UHSD’s Wilderness Community Environmental Education Program (Wilderness CEEP), the field trip provided a day of leadership development and team-building led by teenagers who could advocate first-hand for the real, transformative power of making choices rooted in vulnerability and trust. I watched my students pay attention in a different way to relevant leadership lessons and culture building as we shared a journey outside our comfort zones into the greenspace of a local state park. Your dollars were maximized in supporting the 52 students from Lionel Wilson Prep who attended, and the Wilderness CEEP students and staff of White Hawk, who themselves are living a noble and important mission. Our day began with whole-group team building activities, and then we split into smaller groups to explore the trickier initiatives. We’d prepared for the day with a few activities at our school, and dovetailed the experience with our English unit on self-expression and wilderness literature. 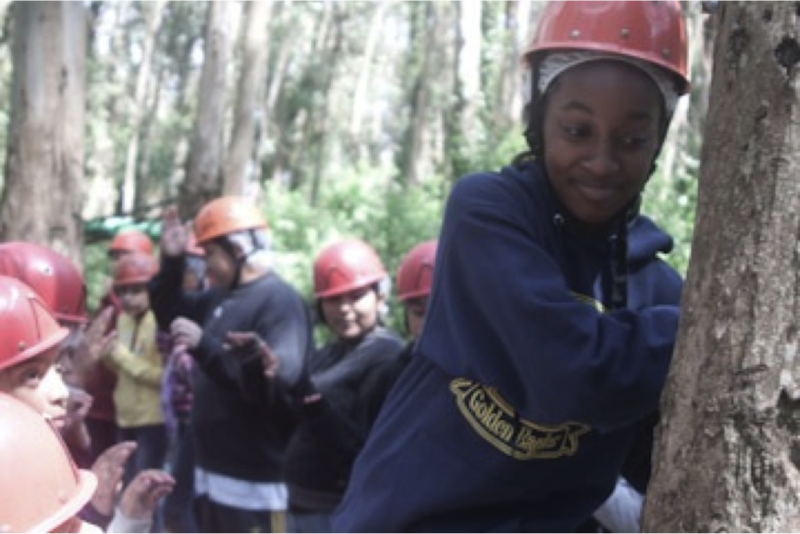 My students connected with the teenage staff members of the ropes course and very much enjoyed climbing, trust-falling and playing together. At the end of the day, I was left with gratitude and inspiration. Inspiration because I know that this kind of learning – experiential, vulnerable, different, and trust-building – is critical for my students’ development, and I am inspired to continue working with PVF to think of ways to incorporate experiential outdoor education throughout the school year, building on a one-day field trip. And gratitude, more than I can say, because our day was powerful beyond measure for everyone involved. Thank you so, so much for making available these quick and trusting grants so that we teachers can follow our own hearts and encourage the hearts and minds of our students. I look forward to continuing to share in your mission of creating relationships and opportunities with high impacts and high returns. Our teacher grant programs are made possible through the generous support of people like you. To contribute to our grant programs to make more experiences like this field trip possible, please click here. This entry was posted in Uncategorized and tagged education, immediate response, program grants. Bookmark the permalink.